What a waste of a great cast. Triple 9 boasts an exciting ensemble of stars, but it’s too wrapped up in the machinations of its banal, faux gritty crime story to let it shine. It’s probably really hard to stand out when apparently the only direction given from John Hillcoat was which level of brooding or self-pity each character was at in any given scene. Or when all of your dialogue exists to fill in character details, advance the plot, and unravel the not-so-mysterious web of intrigue spun in this dull thriller. In order to pull off the difficult task, a plan comes together to kill a cop (police code “999” for officer down) to distract the rest of the force as the crew pulls the job. It’s like a really, really mean interpretation of the distraction tactics of a Die Hard villain. And, oh yeah, two of the criminals – Marcus and Jorge, happen to be cops themselves. Hillcoat has had success elevating coarse genre material to engaging, rugged, and violent drama, notably in The Road and his western/crime/near-horror opus The Proposition. Triple 9 has the raw materials, but fails to deliver shocks despite bloody bursts of viciousness and a morose tone. The plotting is just too painstaking. 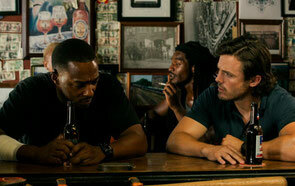 Thrown into the mix are Chris (Casey Affleck), Marcus’s new partner who transferred to the rugged gang unit from a cushy suburban post and who may be a convenient mark for the Triple-9, and Detective Allen (Woody Harrelson), who’s investigating the bank heist and also happens to be Chris’s uncle. Everything and everyone is connected so intricately that a majority of the film is spent on procedure rather than engaging with the characters or their situations. The Triple-9 is brought up fairly early on, and then there’s little mention of it until the plan takes shape. By the time agendas are put into motion, problems are solved by matters of convenience, including secondary characters popping up to provide just the right bit of information at just the right time for Detective Allen. It’s so obvious that Harrelson himself actually mentions things being impossible coincidences on two separate occasions. They do seem impossible, and they’re certainly uninteresting, because we as viewers already have the data he’s collecting. There’s no intrigue in putting the pieces together, merely step-by-step problem solving by characters that are underdeveloped. There are half-baked themes involving familial ties, by both blood and codes of honor, but nothing sticks. Michael’s hand is forced to do the second job when Irina kidnaps his son – a son whose mother is Irina’s sister (Gal Gadot, cast for one scene that follows her legs in close-up). The female supporting characters are especially threadbare. As Chris’s wife, Teresa Palmer is there to make out with him and look concerned after he has a tough day at work. As Allen’s colleague, Michelle Ang exists to provide him information. Most of the criminals and cops are former military men, a band of brothers, if you will, which is another idea presented without meaning or context. The lines between hero and criminal are too thinly drawn to be meaningfully blurred. Operating in an Atlanta underworld of seedy bars, gang-ruled street corners, and housing projects, the good, evil, and ambiguous characters are often shrouded in shadows and deep reds when discussing the nasty business. It’s deliberate to the point of being transparent and ineffective. As are moments of cruelty overly designed to shock – a baby is shown on a bed next to a revolver during a raid on a drug house, three decapitated heads are lined up at a crime scene, and there are several gunshots to several different heads. We’re never in the moment to connect with the carnage because we’re either two steps ahead or too glazed over from inanity to be tense.